The application of ultrasound waves to induce and enhance chemical reactivity dates back to the pioneering studies by Richards and Loomis in the late 1920s. The long journey, now entering the twenty-first century, has been accompanied by decades of low and high research activity. But arguably, the marriage between synthesis, organic synthesis in particular, and sonochemistry has been especially fruitful from the 1980s onwards. We now realize the pluses conveyed by sonication, in terms of efficiency, acceleration and selectivity. Mechanistic switching and/or different product distribution relative to non-irradiated conditions also represent salient features observed frequently in sonochemical reactions. 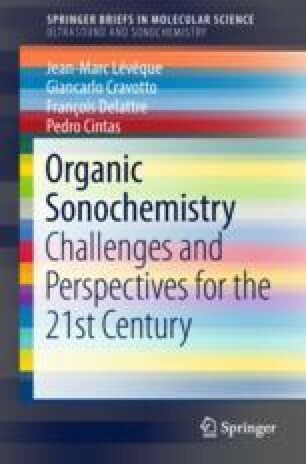 This chapter summarizes a series of fundamental ideas in organic sonochemistry and introduces the subject within the framework of green chemistry and sustainability. Representative examples gathered in recent literature help to appreciate the added value of sonochemistry as tool.